Silent film was universally understood and could be exported anywhere. But when “talkies” arrived, the industry began experimenting with dubbing, subtitling, and dual track productions in more than one language. Where language fractured the European film market, for Spanish-speaking countries and communities, it created new opportunities. 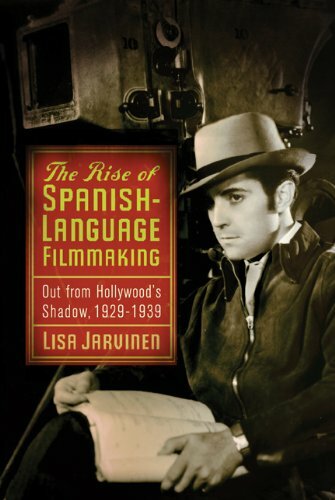 In The Rise of Spanish-Language Filmmaking, Lisa Jarvinen focuses specifically on how Hollywood lost ground in the lucrative international Spanish-speaking audience between 1929 and 1939. Hollywood studios initially trained cadres of Spanish-speaking film professionals, created networks among them, and demonstrated the viability of a broadly conceived, transnational, Spanish-speaking film market in an attempt to forestall the competition from other national film industries. By the late 1930s, these efforts led to unintended consequences and helped to foster the growth of remarkably robust film industries in Mexico, Spain, and Argentina. Using studio records, Jarvinen examines the lasting effects of the transition to sound on both Hollywood practices and cultural politics in the Spanish-speaking world. She shows through case studies based on archival research in the United States, Spain, and Mexico how language, as a key marker of cultural identity, led to new expectations from audiences and new possibilities for film producers.